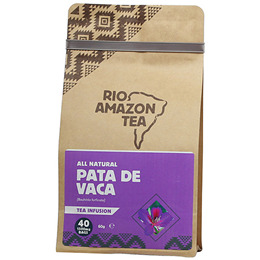 RIO AMAZON Pata De Vaca is normally consumed as tea after each meal. It has been in use for more than 60 years by modern Brazilians. Pata de Vaca (translated as ‘cow’s foot’) is a small tree native to the tropical rainforests of Peru, Brazil, Argentina, Paraguay and Asia. It grows to heights of around 5-10m and produces 7-10cm long leaves that are shaped like a cow’s foot. It is these leaves which are prepared to make an infusion or leaf tea. In South America, Pata de Vaca is normally consumed as tea after each meal. Pure shredded leaves of Pata de Vaca (Bauhinia forficata). Teabag: Unbleached paper. 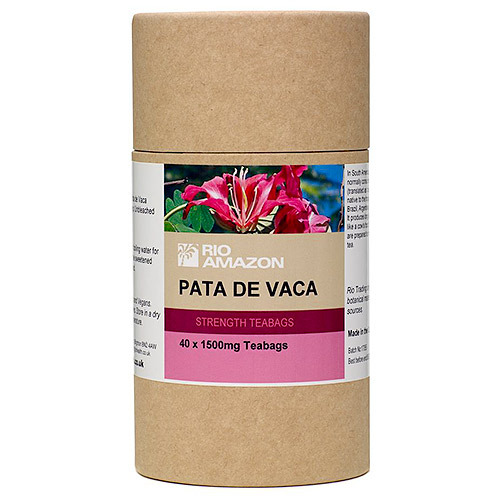 Below are reviews of RIO AMAZON Pata De Vaca - Leaf Tea -40 x 1500mg Teabags by bodykind customers. If you have tried this product we'd love to hear what you think so please leave a review.